M. Chinnaswamy Stadium, Bangalore is the home ground for Royal Challengers Bangalore in the Indian Premier League (IPL) 2017. 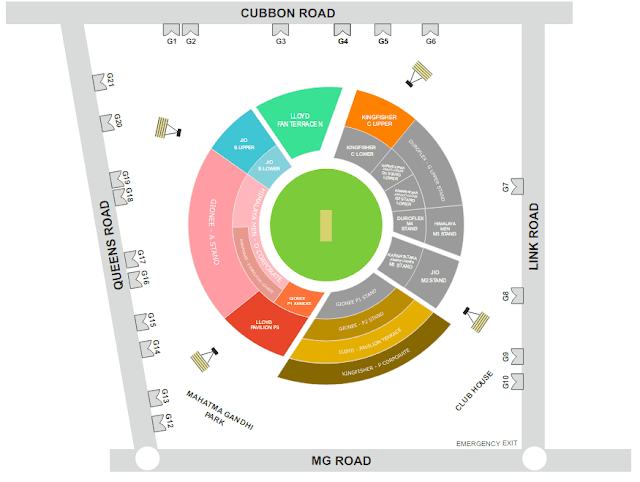 Booking of online tickets for Royal Challengers Bangalore home matches are allowed according to RCB the schedule. Online tickets booking are available on LiveInStyle and offline outlet details are currently not announced. It is mandatory to produce Aadhaar and give fingerprint expression at the time of offline booking and for online booking you must have to produce Aadhar card and produce fingerprint expression at the time of ticket collection. Currently the booking fir the 7th May match between Royal Challengers Bangalore and Kolkata Knight Riders are not allowed.